This year’s hurricane season is the most expensive on record, with $202.6 billion in damages according to Bloomberg. These storms across the Atlantic had devastating impacts on people’s lives and homes, on communities and on infrastructure in the hardest-hit areas. In fact, the damage from Hurricane Harvey is still very palpable for Houston residents. Three months after the storm, tens of thousands of residents lack stable housing. In Puerto Rico, it is even worse: two months after Hurricane Maria, most of the island is without power and one out of every 10 residents doesn’t have access to clean water. Rocky Mountain Institute is working in Puerto Rico and other Caribbean islands to help rebuild smarter and better — that is, rebuilding in a way that increases resilience. The summer’s events have reinforced the importance of resilience for cities and states across the country. For Florida and Texas, improved resilience is at the core of rebuilding efforts. For others, it has become an elevated priority for new construction and infrastructure investment. But for all, the "new normal" caused by changing weather patterns associated with climate change means more frequent, stronger storms and other natural disasters, and that means that resilience in the face of disaster is important as never before. Whether resilience efforts are reactive or proactive, tools exist for cities to take a holistic approach to resilience in the buildings sector that can yield higher-performing buildings (in both existing buildings and new construction), healthier economies and better communities that emit less carbon and lessen future impacts on climate change. One such tool is Property Assessed Clean Energy (PACE) financing. PACE allows the incremental cost of energy-efficient and hurricane-resilient reconstruction to be covered through financing secured by a special incremental property tax assessment. The ongoing savings to the owner — whose energy bill would be negligible — more than covers the payments due under the PACE financing. We believe PACE can help Florida rebuild a more resilient real estate market while providing a boost to the local job market at no up-front cost, and Florida needs it. Florida usually has had a booming real estate market. More than 500,000 single-family homes and 100,000 rental units have been built in the Miami area since 2000. But frequently there has been destruction as well as creation in Florida’s building sector. Just last year, Hurricane Matthew caused $2.7 billion in damage in Florida and $15 billion overall. This year, Hurricane Irma hurt even more Florida homeowners. Federal Emergency Management Agency Administrator Brock Long said preliminary estimates suggested that 25 percent of the homes in the Florida Keys were destroyed by Irma and 65 percent sustained major damage. "Basically, every house in the Keys was impacted," he said. While homes in the Keys sustained severe damage this time, many thousands of other homes in Florida continue to be at risk. According to a recent CoreLogic report, South Florida’s tri-county region around Miami has 784,773 homes at risk from storm surge, more than any other region in the nation. In total, these homes have a reconstruction cost value (RCV) of $143.5 billion. (Threatened areas of New York City have a higher RCV at $264.3 billion, but fewer homes at risk.) When a hurricane next makes landfall directly over the tri-county area, resilience added with PACE financing could help save much of that value. We believe PACE can help Florida rebuild a more resilient real estate market while providing a boost to the local job market at no up-front cost, and Florida needs it. Florida passed PACE-enabling legislation in 2010 and five programs are operating in the state — all offer commercial financing, and two offer residential financing. In addition to covering energy efficiency and renewable energy improvements, many Florida PACE programs finance hurricane protection improvements. Active R-PACE (residential PACE) programs are in 16 Florida counties, nine of which are among the counties where FEMA has made residents eligible for individual assistance. Most homes in these counties were affected severely by Irma. As of November, 144,407 applications have been approved for assistance within Florida and FEMA has awarded insurance payments to individuals and households to the tune of $124 million. These funds should be used to rebuild for resilience, and PACE financing can augment and multiply the resilience that insurance payments can secure. On the heels of these terrifying recent proofs that large-scale natural disasters can and do occur in the U.S. comes a worrisome new report by Attom Data Solutions. 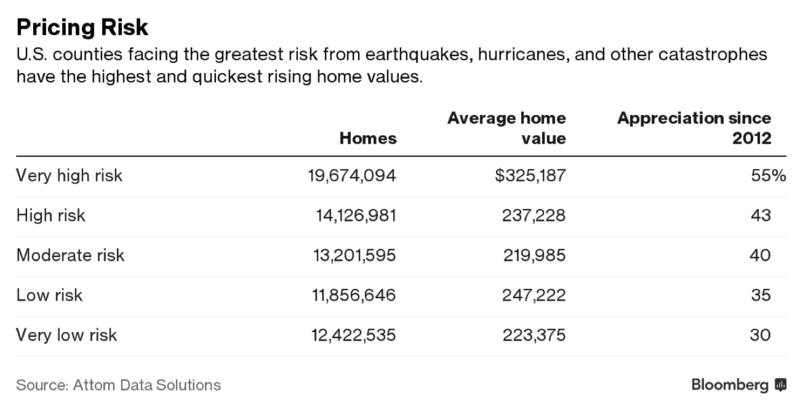 The report finds that the parts of the U.S. most at risk of natural disasters are also the places where property values are highest and increasing most quickly. In fact, the riskiest 20 percent of U.S. counties are economic powerhouses, have the most homes with the highest average home values, and have experienced the greatest price appreciation in recent years. Having so much value locked up in property that is not resilient and is in the path of disaster is disturbing and unsustainable. Figure 1 comes from Attom Data Solutions’ natural hazard index, which matches geographic areas to government data on the risks of flood, earthquake, tornado, wildfire, hurricane and hail. If this were to change, state governments could catalyze billions of dollars in private-sector investments for building new high-performing and resilient real-estate infrastructure for homeowners across the U.S. With PACE financing, these homes could be built to not only be resilient to hurricanes, earthquakes and flooding but also to be resilient to grid failures and to provide superior comfort and energy performance, especially if they are built to net-zero energy (NZE), or net-zero ready standards. In a recently published Insight Brief (PDF), RMI proposed leveraging R-PACE for existing and new construction to help scale net-zero energy homes, which can transform the entire country’s real estate landscape. According to RMI’s research, NZE homes are far more energy resilient, built to a higher-quality standard and higher performing than standard homes and only, on average, $24,811 more expensive than average new homes in the U.S. — before accounting for tax credits and other state/local rebates. According to a recent preliminary estimate by Moody’s Analytics, the combined destruction from hurricanes Harvey and Irma could range from $150 billion to $200 billion. This up-front incremental cost could be funded through R-PACE, freeing homeowners and builders of the burden of that cost. Moreover, even after paying for their R-PACE assessments, homeowners stand to gain an average of $160 every year on their high-performing home, according to RMI analysis. This proposition is a win-win solution not only for policymakers, builders and homeowners but also for the real estate community at large. Scaling NZE homes across the U.S. presents an incremental market opportunity of $33 billion by 2037 that will help make our homes and our cities smarter, efficient and more resilient — helping us build a new America. Along with instituting robust state-level consumer protection measures, leading states and cities have an opportunity to invest in scaling NZE development by enabling R-PACE for new construction. Fortunately, there is growing city leadership across the U.S. to address climate risk and opportunity head-on in the buildings sector and beyond. Many cities are putting in place solutions such as distributed energy — especially solar and battery storage sited on distribution grids — that provide resilience to their electric grids, for instance. And today, more tools are available than ever before to share best practices, programs and ideas that have worked for others. For example, states and cities representing more than half of the U.S. economy have declared their support for the Paris Agreement. If these nonfederal actors were a country, they would be the world’s third-largest economy. State commitments and progress toward these commitments are encouraging, as detailed in the America’s Pledge report recently unveiled at COP23 (although states do need to accelerate and deepen their efforts to hold within reach the U.S. pledge to reduce its emissions by 26 to 28 percent by 2025 compared to 2005 levels). The America’s Pledge report recommends that, to make headway in the buildings sector, cities work together to adopt and enforce ambitious energy codes for buildings. Today, 35 of the 51 largest U.S. cities are developing or already have adopted energy-reduction goals. To help meet these goals, cities can work with both states and the real estate industry on new and ambitious energy codes to optimize the energy and environmental performance of both new and existing buildings. Additionally, the Carbon-Free City Handbook, also released at COP23, is another resource developed by RMI to help cities implement climate policies and actions that place their communities on a path toward sustainable, low-carbon economies. For many cities, buildings are the largest cause of carbon emissions. That’s why five of the 22 recommendations in the handbook are focused on transitioning buildings toward net-zero energy while making those buildings healthier, more comfortable and more resilient — all while creating an economic boon for the city. Overall, city leaders recognize the need to address resilience but, at this point, action is far more important than continued planning. Entire economies and people’s well-being — their homes, their health, their jobs and their families — depend on it.